AMERICA! GO AMERICA! AMERRRRRIIIICAAAAAAA! America is August 4th, right? Well, we’re still about $9K off from unlocking it, but the last of the Ravens figures – the secret one – has been revealed to be a Screaming Bald Eagle! In red, white, and blue colors! And yes, the Horsemen are thinking of giving him a tattered American flag. So, since I picked Quetzalcoatl, does this make me a bad person? As always, go here for the kickstarter. I'll get two. Please please please get there Kickstarter. He's pretty sweet. 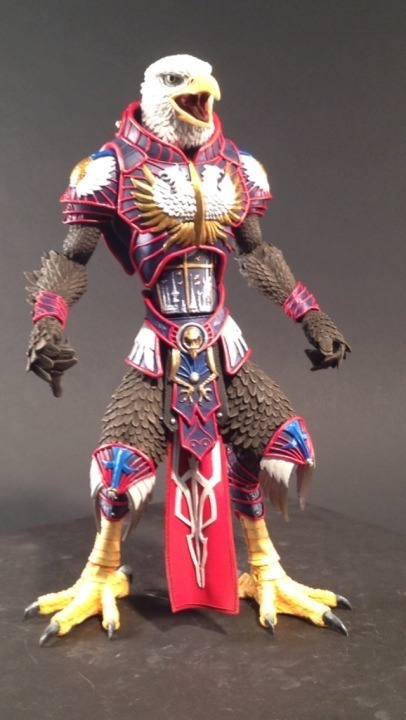 I'm committed to 6 figures right now (initially I told myself to only get 3), but I'm very tempted to increase my pledge for Quetzalcoatl and the Screaming Eagle. the head isn't my fave, but those armor colors are sublime. i love these things, but about 40$ (right?) is too much for me….